The value of Vietnam’s LED market is estimated to reach $729 million by 2022, according to the Vietnam Light Emitting Diodes (LEDs) Market - Drivers, Opportunities, Trends and Forecasts: 2015-2022 report released by Inholic Research, a global ICT market and consulting organization. Vietnam’s rapid development has resulted in increases in per capita income and greater power demand in daily life. This has resulted in electricity prices rising, and LED-based lighting products are now seen as suitable solutions for cutting electricity consumption. The government has been facilitating the growth of LED products in the country, which has resulted in rapid growth in the LED products market. Looking at the fast-paced growth in the country, many multinational companies have invested in Vietnam in the past two or three years and established production facilities around the country. 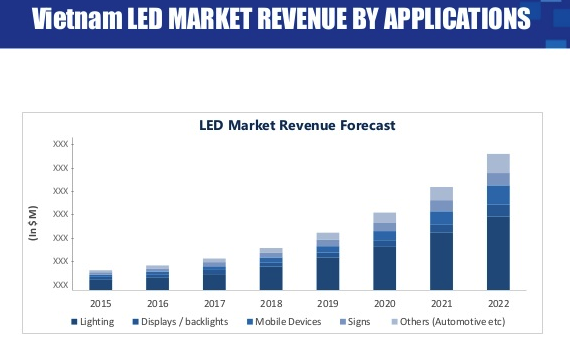 The LED market in Vietnam is expected to grow at a CAGR of 18.2 per cent during the forecast period of 2016-2022. The market analysis is based on the major application of lighting, displays and backlights, mobile devices, signs and signboards, and others. The application of lighting is further divided into indoor lighting and outdoor lighting along with bifurcation in bulbs, street lights, and spotlights. The LED lighting segment is expected to grow the fastest in the application of LEDs in the country. The lighting segment is also expected to make the largest contribution during the expected entry of large multinational companies, cutting LED prices and lowering the cost of industrial development. Established trade relations between Vietnam and China will be helpful in sourcing LEDs for LED manufacturing facilities in Vietnam, which are constantly improving. The Inholic Research report covers and analyzes Vietnam’s LED market, presenting key insights into the industry. It aims to provide an opportunity for players to understand the latest trends, current market scenario, government initiatives, and technologies related to the market and also helps venture capitalist understand companies better and make informed decisions.